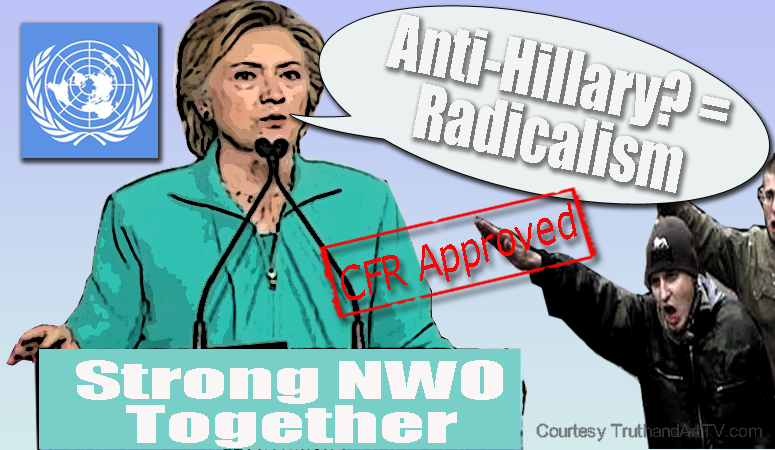 Attempting to Re-Direct Global Awakening Hillary Warns Of New Radical "Alt-Right"
We are living in historic times from a political awakening point of view. Many things are being revealed. Welcome to the information age which is making it nearly impossible for the ruling elite who want to run the world to succeed. Because of this wide open information age, which is making (particularly) US Intelligence operations impossible, the controllers are constantly having to come up with new ideas and plans to combat the naturally evolving awakening that humanity is now experiencing in conjunction with this bizarre, historic, zany and unpredictable informational warfare known as the 2016 US Presidential race. The Presidential race here in the US has proven the main vehicle of opportunity to expose the Clinton crimes of the past and the present which for years even decades most people were unaware of. The recent body count so peculiarly linked to Hillary's quest for the Oval Office is clear to see for everyone who is not a staunch coincidence theorist. We've seen it all over the past weeks; voter fraud, candidate betrayals, the FBI looking the other way on Hillary's undeniable crimes and much more. Additionally, the cover is now blown wide open on the formerly relatively secret Clinton Foundation. Today, anyone not brainwashed by the Hillary-CFR-CIA-mainstream media propaganda machinery can easily research this issue and see for themselves that the very mainstream media now reporting on the greatness and the benevolence of the Clinton Foundation is the exact same media channels and platforms that have heavily donated to the Clinton Foundation. And any reasonable person can see that it's madness to believe that anything the mainstream media tells us about Hillary is objective and not part of her own promotional campaign. With the recent revelation of the Clinton Foundation donors we actually have proof that the mainstream media IS part of the election campaign for Hillary. With all of these crimes and corruption now coming to the light many Americans now see and understand what is happening to America (and the world) and they are responding to this revealed knowledge. Meanwhile, the Clinton-mainstream media campaign is obviously looking to control the damage being created by all the recent revelations about Hillary including her poor health, the growing body count as they apparently murder (or attempt to murder) anyone in their path and much more. The question then is, how is the Hillary-CFR-mainstream media machine planning to respond to this challenge? One of the answers was recently revealed to us in a Hillary Clinton speech where she labeled her critics and all the new revelations about her criminal past as radical "Alt-Right" propaganda. This is not conservatism as we have known it. This is not Republicanism as we have known it. These are racist ideas, race baiting ideas, anti-Muslim, anti-immigrant, anti-women, all key tenants making up the emerging racist ideology known as the Alt-Right. Now Alt-Right is short for alternative Right. The Wall Street Journal describes it as a loose but organized movement, mostly online, that rejects mainstream conservatism, promotes nationalism and views immigration and multiculturalism as threats to white identity. My first thoughts after seeing this propaganda was perhaps Hillary should have a talk with Zbigniew Brzezinski who himself admitted that more than ever humanity is politically awakened and this is making it difficult for the ruling elite (like Hillary) to achieve their goals. Hillary is apparently completely removed from this reality and instead is suggesting that anyone who doesn't believe mainstream media lies is completely "disconnected" from reality! As if adding insult to injury she then goes on to endorse the Sandy Hook and 9/11 official stories! This is just a preview to how nasty the information war will get over the next few weeks. The main purpose of this strategy is to use this new label of "Alt-Right" radicalism as a tool to deflect tough questions about her past. By opting for ridicule, labels and name calling she (Hillary) doesn't have to answer questions about the topics that are being revealed knowing full well that any of these topics could destroy her fragile road to the Presidency. She can instead brush off all tough and reasonable questions as "Alt-Right" radicalism and propaganda not worth her time. The obedient (Clinton Foundation heavy donor) mainstream media, particularly the pro-Hillary liberal media is then silently put on notice: don't ask about these Trump radical "Alt-Right" conspiracies keep it about more favorable issues. Question- Did you hear about all the corruption and crimes linked to Hillary, Bill and the Clinton Foundation? Answer- Oh, none of that is true, it's just (pro-Trump) radical "Alt-Right" propaganda! So "Alt-Right" is the new term on the one hand officially expanding the reach of "conspiracy theorist" so that many more people can now be tucked under this label, and on the other hand it creates a view of a radical terrorist-like radical movement spanning the globe that needs to be stopped. Their (those who believe Hillary is a criminal) thoughts, opinions and concerns can then be chalked up to believing "Alt-Right" propaganda or even worse, radicalism. As I mentioned in a recent article, we are now seeing frightening levels of what I see as a cutting-edge propaganda war waged on the American people. I urge all truth seekers to become skillful at identifying the over-the-top state propaganda so that you can quickly help get the word out. The fact that the ruling elite are resorting to extreme reactionary labels shows us that they want the masses to react based on emotions not based on intelligent critical thinking and research. They also hope to make "Alt-Right" the new "conspiracy theories" thought-blocker weaponized term. The criminal machinery driving the Hillary campaign is now determined to live and die by the "labels" strategy as they pull all the punches to discourage people from thinking on their own and finding out the truth behind the Clinton criminal facade. The fact of the matter is that this new exceedingly-broad thought-blocker term sweepingly labels everyone who criticizes or doubts Hillary or opposes her campaign as a victim of deceptive "Alt-Right" disinformation or even radicalization. I see this also as an expansion of the 2011 "domestic terrorist" psyop campaign that followed the Bin Laden death hoax of May 1st. This again is simply the latest version of that same campaign in a now historically sophisticated information war that we are all living through and witnessing with our own eyes.